Why are Drum Muffs better? Drum Muffs are made of 4 layers starting with a polyester top with printing on it, a 5 mil layer of aluminum over a specially designed medium density foam, ending with a 3M Corporation unique adhesive. Drum Muffs work because they are using sheer strength to control vibration. Aluminum over a semi rigid base is able to affect a much more targeted and significant resistance to the vibrations in cymbals and drum heads than gels. There is no other product on the market that has this combination of materials. The acoustic precision that is achievable is unrivaled in the industry. Drum Muff is the first product on the market that allows drummers to rid their kick drum of pillows and other sound absorbing products. Get “all” of the intended sound out of your kick drum without the unwanted boom and resonance with Drum Muffs. Unlike gels, the Drum Muff sticks to the bottom of cymbals and drums. (Drum Muffs outperform the gels by a factor of 3 times!). Unlike being forced to use specialty sticks, the Drum Muff allows you to use your current sticks – allowing for the true “feel” you want. Unlike drum rings, the Drum Muff does a better job and takes up a fraction of the real estate on the drum. And… the Drum Muffs will not fly off during a solo like the drum rings! All in all, this is the best solution! Drum Muffs come in three sizes allowing for total flexibility in location and sound. Location matters. Adjust your sound and tone by location on your drums. Drum Muffs are not sticky, and they will not attract dust or fuzz like gels. They can be moved over and over again. Drum Muffs will enhance the sound of your drums, rid unwanted ring from your toms without eliminating the tone of your drum. Most users say that our Drum Muffs actually improve the tone of the drum. Can Drum Muffs be moved? Yes, moving them is easy. The special 3M adhesive maintains adhesion so you can move them around without adhesive loss. If the adhesive surface gets dirty, simply wash with soap and water and let dry. The adhesive layer is then renewed. We guarantee you will be thrilled or your money back! We are so sure of our product that we will not only refund your money, but will also refund the shipping cost. You have nothing to lose! How many Muffs come in a package? To see what is in all of the packs, see our order page. I play drums in a church, will Drum Muffs help reduce the volume? Drum Muffs are the answer to a prayer! All too often churches will purchase expensive Plexiglas shields and find that the noise reduction is minimal. Drum Muffs and/or Cymbal Mutes can reduce the loudest part of a drum set, the cymbals, by over 20 decibels. There is no other product on the market that can do this. Drum volume can also be decreased somewhat. In tests, Drum Muffs reduce the volume of drums and cymbals by 3 decibels. Lastly, we have been told that drummers in churches have to release the snare during services as the amplified speaking rattles the snare. We have found that putting a large Drum Muff on the bottom of the snare can reduce or eliminate this issue. Church drummers love Drum Muffs! Drums too loud for playing at home? We often hear that drummers want to practice at home but end up annoying everyone in the house – including neighbors. You can place the Drum Mutes near the outside edge of the cymbal to reduce the volume almost totally. Move the Drum Mute toward the bell for a louder sound. If you want to lower the volume of drums to play at home, consider purchasing the a Mega Set and a 6 Pack to use on the drums. This setup required a Mega set and a 6 Pack Drum Muffs. 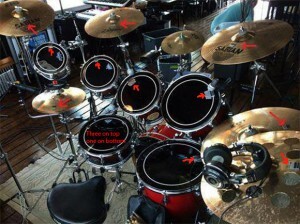 Where do I place the Drum Muffs on the drum set? We recommend starting out with the configuration in the below photo. That being said, you may quickly find out that your taste and preferences may be different. Some find that placement on both the batter and the resonant head works. Some find that simply one Drum Muff on the batter head only. Small Drum Muffs are usually placed near the bell of cymbals and on the snare and smaller toms. 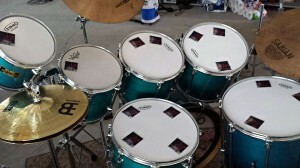 Large Drum Muffs are generally place on larger toms. Large Drum Muffs are generally place on the kick drum and the bottom of the floor tom. Why are the Cymbal Mutes so sticky? The butylene rubber adhesive is what allows you to place them and keep them where you want them. It is best to keep them separated while not in use. The best storage method is to purchase one of our cases along with your order. They are packaged and shipped in a nonstick material to keep them in good condition. Keep in mind, when they are freshly put on, they are easy to remove and place in different locations until you hit the sweet spot. The adhesive gains strength over time. If you get any residue from the Cymbal Mutes, our Miracle Cleaner will remove them with ease. Can I use Drum Muffs if I Mic the Drums? Drum Muffs are used to reduce the stage volume of the drums and cymbals while giving us the ability to turn the sound up the in-ears and PA system. All too often the cymbals are so loud that the sound bleeds into every single microphone in the band. By reducing the volume and using microphones, you can achieve a great sound and acoustic precision that cannot be achieved any other way. Do I need to play softer when using Drum Muffs? Absolutely not! Drum Muff’s were designed with the drummer in mind. For some drummers, me included, it is difficult to play some hard rocking/faster songs quieter. Drum Muff’s give you the freedom to play quieter with the same feel as playing normal. You can be back in control of your drumming while giving the band members peace of mind. I have a child that is learning to play drums. Will Drum Muffs and Cymbal Mutes help? Oh, yes! You can reduce the volume of the cymbals so much that the you will hardly hear them if you like. The advantage over other alternatives is that you will still have the same “feel” when playing. Cymbals are easily the loudest part of a drum kit. If you use several Drum Muffs on the drums, you can reduce the volume to a tolerable level too! We suggest you get the Mega Kit for this solution – and possibly the addition of the Cymbal Mutes. How do Drum Muffs work with recording? Drum Muffs are a studio session dream! You can rid your kit of unwanted tones and resonance. Drum Muffs actually can act as a “gate” to the kit. All too often recording studios have to gate the drums using software. Not the case with Drum Muffs! You can also turn down the volume of your cymbals as if there was a volume dial on them. There is no other way to have this level of acoustic precision on a drum kit. Several professional studios have commented that they have difficulty with the volume of the high hat volume. They say that the snare microphone picks up the high hats as well and they become too loud. Simply put a Drum Muff on the inside of the top high hat. Problem solved! There is no product on the market that does all that Drum Muff does!